The New York Times blog today published in full a speech given by photojournalist Joao Silva at the Bronx Documentary Center earlier this month. Silva was severely injured after stepping on a landmine in Afghanistan last year. Silva lost both legs below the knee, with months of recovery ahead of him at the Walter Reed Medical Center in Washington. Just last month his work returned to the front pages, with an image accompanying a story about the closure of the very medical centre in which he was staying. In his speech, published in full here, Silva describes that moment in October last year when “everything changed”. I heard the mechanic click. I knew: this is not good. And I found myself lying face-down on the ground, engulfed in a cloud of dust, with the very clear knowledge that this has just happened and this is not good. I could see my legs were gone, and everybody around me was dazed. I was like: “Guys, I need help here.” And they turned around and saw me on the ground. They immediately sprang into action. I got dragged out of the kill zone, for safety reasons, to a patch of ground a few yards away. Silva also used his speech to offer advice to young photojournalists keen to enter the field. And the key is perseverance, he said. It’s not an easy industry. It’s highly competitive. Every year there are literally thousands of young kids coming on the stage, a lot of them so talented. For freelancers, it’s a juggle every day. There’s only so much money going around. There’s only so many publications that will employ people. Even though demand for knowledge and content has grown, the market has shrunk. It’s really sad, but it’s a reality. As for Silva’s own journey, he said it is likely to be another year before he is “fully functional”, but added that the ultimate goal is to get back to work. Without a doubt, life is strange. Everything has changed. But I hope to pick up from where I left off, to a certain extent. In the meantime, I just take a little more courage and a little more perseverance — and quite frankly, take as many drugs as I can. This entry was posted in Editors' pick, Photography and tagged Afghanistan, conflict reporting, injured journalists, joao silva, New York Times, photo journalism, photographers, war reporting on August 30, 2011 by Rachel Bartlett. This week, Journalism.co.uk is publishing extracts from a new book about the media coverage of the Afghanistan war. ‘Afghanistan, War and the Media: Deadlines and Frontlines’ brings together the testimonies of frontline correspondents and detailed academic analysis, with a particular focus on the pros and cons of so-called ’embedded’ journalism. Earlier today, we published an introduction to the book by journalism lecturer and co-editor John Mair, followed by a look at the dangers of ‘news management’ by Frontline Club founder and war correspondent Vaughan Smith. Smith’s essay will be followed in the next three days by contributions from Channel 4 News presenter and war correspondent Alex Thomson, Sky News’ Asia correspondent Alex Crawford, and others. All extracts published so far can be viewed at this link. This entry was posted in Broadcasting, Press freedom and ethics and tagged Afghanistan, alex thomson, deadlines and frontlines, John Mair, vaughan smith, war correspondent, war reporting on August 31, 2010 by Joel Gunter. Power and the media are not just about cosy relationships between journalists and political leaders, between editors and presidents. They are not just about the parasitic-osmotic relationship between supposedly honourable reporters and the nexus of power that runs between White House and state department and Pentagon, between Downing Street and the foreign office and the ministry of defence. In the western context, power and the media is about words – and the use of words. It is about the employment of phrases and clauses and their origins. And it is about the misuse of history; and about our ignorance of history. Fisk goes on to discuss the words and narratives inherited by journalists when reporting on conflict and war, and how this affects the media’s ability to challenge those in power if it is speaking the same language. This entry was posted in Journalism and tagged Al Jazeera, Independent, Middle East, Middle East correspondent, Robert Fisk, war reporting on May 26, 2010 by Laura Oliver. 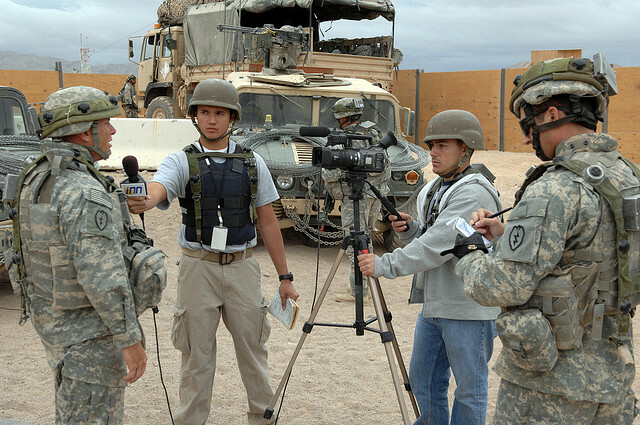 Story from the beginning of this week – the US government is using a PR firm to run background checks on journalists sent on embedded assignments with the US military. “Rendon examines individual reporters’ recent work and determines whether the coverage was ‘positive’, ‘negative’ or ‘neutral’ compared to mission objectives, according to Rendon officials. It conducts similar analysis of general reporting trends about the war for the military and has been contracted for such work since 2005, according to the company,” reports Stars and Stripes. This entry was posted in Editors' pick, Journalism and tagged military, stars and stripes, us, US government, us military, war reporting on August 28, 2009 by Laura Oliver.